Dig around in your dresser drawer, and chances are that you'll find old gift boxes that are too nice to throw away, but you're not exactly sure what to do with them either. Well, Stephanie can help. In her latest Creative Output video tutorial, she shows you, step by step, how to use your photographs to transform old gift boxes into functional works of art. This is the first in a two-part series. 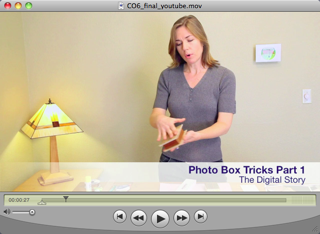 In part 2 she'll show you how easy it is to make your own box. I want Stephanie as my next door neighbor!